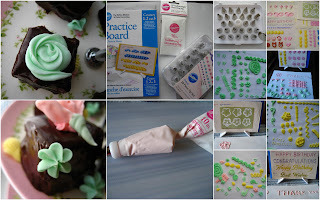 Wilton, a top brand for cake decorating supplies and bakeware, has provided me with a few products to test and review. The very sweet and generous folks at Wilton sent me a Wilton 28 Deluxe Tip Set , a Practice Board Set and a 10 inch Featherweight Decorating Bag. Wilton has a ton of other products, all sorts of classes, downloads of various patterns , and a bunch of recipes. I am always excited when I see recipes:)! They have some valuable resources available for the beginner decorator or even for those who have some experience. They come up with new patterns and new ideas...So do check the them out. I love their step-by-step decorating techniques. 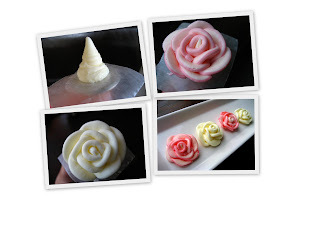 There's even a video you can watch... teaching you how to make roses on the flower nail provided. That's pretty neat! I am not much of a cake decorator, so I first needed to learn a few basic techniques. I started practicing using the 28 tips that were provided in the Wilton Tip Set. Some of the tips are made for different sized jobs. For instance, you can make the same flower in a smaller or bigger size. It really is nice to have the various tips. Some can be used for bigger cakes while the smaller tips can be used to decorate smaller pieces such as, petit fours, cookies, candies, cupcakes, etc. I was able to easily follow some of the steps to make patterns from the practice sheets included in the Practice Board Set. I enjoyed learning to make the basket weave, flowers, tulips, borders, etc. I still need to practice...But, it's amazing what you can do when you have some good quality decorating tips! You can really make your baked goods look extraordinary with just a few decorations. The tip set lets you create basic and advanced borders, flowers and more. They are durable and well made. This set will provide you with enough tips to make a variety of decorations. These tips should last for a very long time! Featherweight bags feel comfortable as you work with it and are quite soft. They are supposed to get even softer the more you work with them. The bags are made of polyester and are lightweight, but they are strong and flexible as well. They are coated to prevent grease from coming out. What I really liked about them, was that the bag didn't stain, it was easy to work with, and I had no problem washing it by hand. Wonderful. They are even dishwasher safe. The set is updated with large color pattern sheets that comes with a plastic stand. You can practice on a piece of paper or you can slip the paper sheets under a vinyl overlay and trace the patterns in icing. It contains Courses 1, 2, and 3. It includes a stand and 20 full-size patterns. 9 x 6 in. It is ideal...a perfect way to practice, practice, practice! This set helps you do that... on a vinyl overlay that you can just wipe off. Pretty neat. I first practiced making different shapes from the practice board. I used paper to make my practice decorations on. That was a lot of fun! 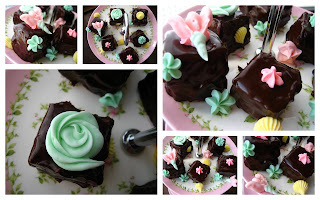 I then decided to decorate some small cakes. I even made some decorations that I air dried....sort of like those soft pastel sugary mints, except in pretty flower shapes. 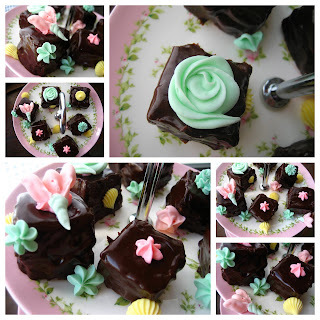 I very much like afternoon tea, and I was so anxious to make some petit fours. I wanted to have some fun and decided not to be stressed out if the final product would not come out perfect. I had a ton of fun making the little desserts. I loved the fact that the tip set has a coupler which allows you to change tips and make as many different shapes as you like. Even with my lack of experience, I really enjoyed how the tips made the job of decorating really easy. I made some fancy little flowers/decorations with the tips. I even tried my hand at making roses... on the flower nail. After a few tries, I was able to make a few that I was pretty proud of ...for a first timer:). It's kind of exciting to see plain cakes get transformed into something pretty with the help of some tips and a decorating bag. I did learn that the decorating goes much smoother if your frosting is on the cooler side. It can get warm from the heat of your hands. All I needed was to place the frosting bag in the fridge for a few minutes. Chilling the frosting helped it to shape much better. Looking forward to using the Wilton products to make my baked goods look pretty:)! I love the help that's provided on the Wilton website. There really isn't any reason why a beginner can't learn to decorate. Wilton provides such useful and helpful information and makes for a very fun activity. Overall, I would recommend the Wilton products for those of you who like to bake and decorate. I was so blessed to inherit my grandmother's Wilton set. Not only are they wonderful, they last for years and years! I don't have as much time to use them anymore, but they are so useful for many things. I don't recall ever seeing the practice boards, though, what a great idea!